Canola oil occupies a special place among vegetable oils, because like olive oil, it is composed largely of monounsaturated fats that are good for cardiovascular health. It is also a source of alpha-linolenic acid, an essential fat from the omega-3 family and contains vitamins K and E.
With its neutral taste and high ‘smoke point’ (temperature at which the flavour and nutritional value start to deteriorate), canola oil is an excellent all-purpose oil. Canola is a variety of canola seed (the more marketing-friendly term for rapeseed) that was developed in Canada. 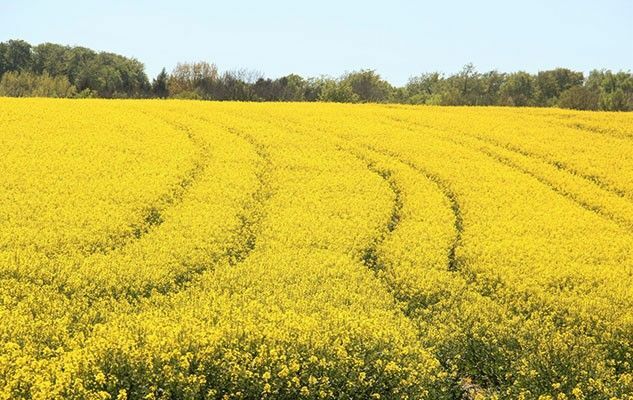 The word ‘canola’ is a neologism created by Canadian rapeseed farmers and is derived from “CANadian Oil, Low Acid”, as it refers to its low erucic acid content. Almost all the canola oil that is sold in stores across North America is refined. Unrefined (natural) oil that is yellowish-green in colour is also available, and it has an almond-like flavour. This is used in salad dressings and vinaigrettes as it deteriorates at high temperature. Originally published in the Journal de Montréal on May 4, 2013.